Student loans affect millions of Americans, many of whom struggle to make their payments every month. Besides income-based repayment options and refinancing, there are few options for those barely squeezing by. However, one that is rarely discussed, but still applies to some borrowers, is student loan discharge. Read below to see if you qualify and what you need to be able to discharge your loans. Borrower defense to repayment involves proving that the university or college deceived the student in some way that involved them taking out student loans. If a university defrauded a student in a manner that led to the student taking out student loans, he or she may be a good candidate to have their loans discharged. Some examples of fraud include falsifying job placement figures, total school costs, successful credit transfer records and what kinds of degree programs would be offered. That’s part of what happened to students who attended Corinthian Colleges, a network of schools that was found guilty of lying to students. Over 15,000 students have had their federal loans discharged as a result, according to the latest report from the Department of Education. However, “personal injury or civil rights claims” according to Fleischman, aren’t grounds for having your federal student loans discharged. This is important to note – simply because a lawsuit has been filed against a college or university doesn’t mean anything for your student loan debt. 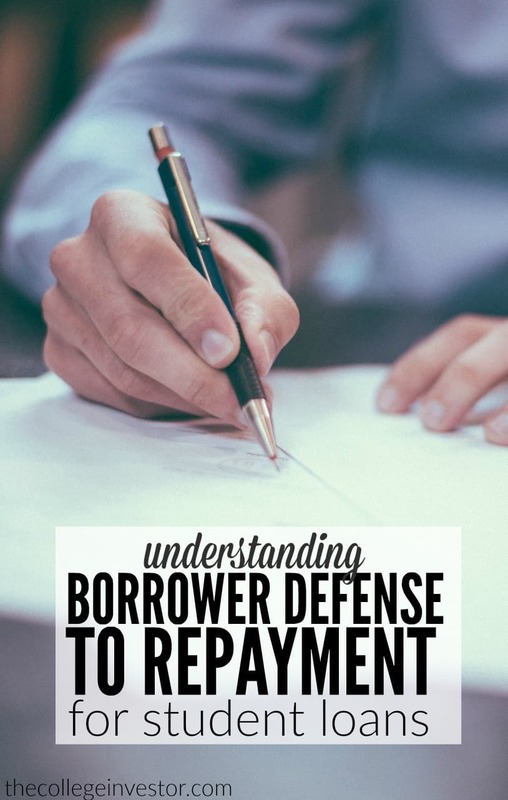 You personally need to look at your situation and go through the process if you believe you might be eligible for borrower defense to repayment. It’s important to note that borrower defense to repayment is an option to get your student loan debt discharged – it’s not a student loan repayment plan that offers loan forgiveness. This is important because there are student aid companies and student loan assistance companies that are directly advertising to students who attending Corinthian Colleges and similar with the promise of student loan forgiveness. If you are looking for help with your student loan debt, make sure you ask specifically what the company is going to do for you. In many instances, these companies are simply signing you up for an income-based repayment plan that includes forgiveness. And while that may work for the short term to help you afford your student loan debt – it’s not borrower defense to repayment which may get your total student loan debt discharged. A few borrowers have successfully discharged their student loans in bankruptcy, but that’s a rare circumstance. A lawyer specializing in private student loan matters might be able to say if your case is sound enough to go to court or not. Make sure to understand their fees before you take on a court case, so you don’t end up worse off financially than you were before. Have you, or do you know anyone, who’s been successful in taking advantage of borrower defense to repayment? I recently received a message from slcofa.org, over facebook messenger. It was through an article about ITT Technical Institute closing. I graduated from there back in 2004 and they said my loans could be forgiven if paid over 24 months. My loans are currently through Great Lakes, and these guys sound good, but before i commit to anything, i would just like to know if you guys feel they are legit. Thanks..
With the whole DeVry lawsuit between the FTC, only students who had loans dispersed by DeVry was discharged. Those who had federal loans and other private loans didn’t have their loans forgiven who those who first enrolled in Jan 2008 to Sept 2015. Am I able to use the Borrower Defense to Repayment to get my federal loans discharged due to DeVry’s lawsuit for misleading ads used on perspective students? I was a student that enrolled in 2014. You can definitely attempt it, especially if you have documentation. I wanted to know if anyone has ever heard of the Student Doc processing company? I found them while researching The whole Kaplan lawsuit. They said I qualify for the Borrower Defense To Repayment. They stated that it would be up front $499.00 for them to handle the case. In the mean time they will report to the credit bureaus that my loans are being investigated so I will not have to make any further payments and it will not screw up my credit. They also stated that they will filing to get my loans discharged as well as looking for me to get repayment on what I have already paid. I was wondering how you are able to check the status of the DTR? I submitted the documentation 6 months ago. Any assistance would be appreciated. You should be able to contact your loan servicer and ask about the status. They can at least confirm that you are in forbearance as a result of the application. I went to the University of Phoenix for an MBA. They told me that their program was looked upon as seriously as any other brick and mortar school’s program. Boy, what that a misstatement. I have been getting a lot of emails about a lawsuit against the University of Phoenix for deceptive practices. Especially from “United Legal Aid”. Has anyone heard of them and is it worth checking out? I spoke with them today and I think they may be a scam. I attended Ashford University and contacted United Legal Aid, but their website also stated United Legal Discharge. The website seems rather generic and didn’t have the https:, which made me feel uneasy. I’m hoping to find some information or how I can possibly get some of my loans forgiven. Ashford was a horrible decision. The school was expensive and I have not been able to find a job. My degree hasn’t been viewed seriously. I have been paying on my loans since 2008. In the first few years it was interest only payments and then switched to standard repayment plan. In 2012 I decided to apply for PSLF program since I work in a hospital that is not for profit. I found out I qualified and asked a rep from Navient/Sally Mae not once but twice if my repayment plan qualified for the loan forgiveness to which I was told yes. Now I resubmitted paperwork to keep my employment status up to date, and all of my loans were transferred to myfedloan. Now I am finding out from this company that my previous 5 years of on time payment are not the correct repayment plan for PSLF. To add insult to injury only $5000 of the principle balance has been payed down after all of these years of payments. I am so frustrated and feel like I have been deceived by Navient/Sally Mae. How do I go about getting credit for these last 5 years I was screwed out of? Sadly, your story is not unheard of. But I have yet to see anyone succeed in getting credit for non-qualifying payments. If you had some type of proof, you might be able to take them to court, but you’d need to speak to a lawyer about that. I need some guidance here. I received a check from the FYI for my.portion ifnshe settlement. I too have federal loans currently on in school deferment. I enrolled in 2011 and graduated with my AAS in 12/2012. But found no one would hire me, so I returned in 2/15 for my Bachelors, and I am to graduate with my Bachelors at the end of August. Do I need to just apply for the borrowers defense? Will my degree be null as a result? Do I have to “prove” fraud? I’m so confused. Well, it sounds like your back in school for your bachelors and haven’t graduated yet, so no fraud there. It was hard to understand, but you received a settlement check from your time getting your AA degree? If that’s the case, I would use that check to pay off a portion of your student loan balance, and then move forward with your bachelors when you’re done next month. Have you heard of “Elite Borrowers Protection .com”? they are connected to Elite Consulting Services. Are they legit? I have read that the borrowers defense to repayment can be a hard process and you may need legal help. They ask for $949 upfront for lawyer fees. which is pretty steep considering they haven’t done anything yet. Its a money back guarantee that your accepted into it though. Then apparently they are going to use my case in a class action lawsuit against the Art Institutes of California along with whoever else buys into this. Seems too good to be true but not sure. Please advise. Read the red flags in this article and understand what you’re getting into: How To Find Companies You Can Trust For Your Student Loan Debt. You might also find this article useful: When Do You Need A Lawyer For Your Student Loan Debt (And How Does It Work)? Thank you! have you heard of this company before? I just talked to these people today. On the phone he tried to get me to re-set my EDFinancial.com password so they could verify my loans. This seems very fraudulent to me. But there’s literally nothing about them online besides their own site coming up in searches, negative or positive. At first glance their website seems professional enough but I don’t like the look of some of their stock images and their “Cause of Action E Book” that they emailed me seems a little thrown together as well. My instinct is telling me no. Have you contacted them further? I attended FMU, aka Everest in 2001/2002 acquire 14k in student loans. I withdraw for semester to deal with my son passing. Decided to transfer to St. Petersburg College to finish my AA to fibs or that none credits were any good. I’ve spend 15yrs paying on loans, multiple times wages garnish. I have slowly taking classes and pay outpocket because I don’t qualify for financial aid. It has ruin my credit and it’s being financial for me & my 4 boys. I currently owe $1,100. Is there any way to get help? You can apply for Borrower Defense to Repayment, and specifically state that none of your credits would transfer. However, that may not work. You are probably best off looking to earn a little more to pay off the balance of $1,100. If you can focus on earning an extra $100 per month, you’ll have it paid off in less than a year. I attended Colorado Technical University online starting in 2004. I was told I would finish school in a little over 2 years. I was recruited much like the military does in fact worse. I was told I wasn’t going anywhere attending the community college I was at. They promised great job placement and a great education. They had me take out over $36,000 in loans. Half way through the program they told me I didn’t have enough credits when I joined in 2004 and I have to either take more classes and take out more loans or take CLEP courses. I couldn’t afford to do either so I had do drop. Out. I feel I was misled as I was not told I was going to have to take out more loans and take more classes. Are private Loans in this situation still not eligible under borrowers defense? Private loans are no eligible for Borrower Defense to Repayment. Only Federal loans are. If you believe that you were the victim of fraud, you could potentially consider speaking to a lawyer. Here’s a link to Finding A Student Loan Lawyer. I got a settlement from ftc a few weeks back for devry lawsuit. Got a whopping 168 dollars. Anyway, I owe 62k for nothing. No degree , not even a devry pencil case. I make so little an hour (8.80) that I’ve paid 0 a month for 4 years now. I did the borrowed defence that the ftc highly recommended in their letter with the check I got. All my devry correspondence was via phone. Anyway, I have my loans originally via Sally may, but now through nelnet. I think they’re federal. I hope I get them erased because as I said in my borrowers defence app, I’m all for loan repayment IF I get what I’m paying for… But I got nothing. I’m paying for nothing. No degree, no cert, nothing. I hope they’ll delete my loans so I can attend a real school and do it correctly. At 44 yrs old, I’m running out of time to have a life and good retirement. I have no documents to show but it’s easy to see the 62k I owe and zero degree. All I wanted to do was better my life. Now I owe 62k for having my name on devrys internet classroom attendance list. Sorry. I don’t have my bachelor’s because Devry never ever said the loan Max wouldn’t cover all my education. I was under the impression that all was good. Never even crossed my mind loans could run dry, until the day 70% into my degree I got a call saying no more college. Pay it all back or stop going. I went to Devry and have some private loans and want to use the Borrower Defense to repayment but have a cosigner for those loans. I want to know how it will affect our credit or credit score? Will the score go down or does it say ” Borrower Defense to repayment “? You could also consider a lawsuit if you believe that fraud was involved. I went to a Sanford Brown Institute, a Career Education Corp owned business. I have applied for Borrower Defense and have heard nothing. Also, Sanford Brown Institute has shut it’s doors. Is there ANY help in fighting Against my loans? Other lawsuits have proven their fraud. How can I add these to my claim for defense for a better chance of being granted Borrower Defense forgiveness? Any information would be GREATLY APPRECIATED! Under Trump, pretty much all Borrower Defense to Repayment applications have frozen. If you believe you were the victim of fraud, you can contact a lawyer – but given they’ve already shut down, it might not lead to much recourse. are the application for the borrowers defense to repayment still postponed till Besty Devos law suits are settled? I attended WyoTech Long Beach from 2013-2014 just before it closed down. Despite graduating, the certificate of completion isnt worth the paper its printed on. In fact I have stopped showing potential employers my certificate altogether as ive found it more difficult to secure gainful employment. since the Corrinthian colleges went bankrupt my certificate is looked at as no good by employers. Ive filed my BDR application but ive just recently read an article stating that all applications are on hold indefinitely pending a law suit against Besty DeVos. If I knew then what I know now I never would have considered attending WyoTech. There hasn’t been any official announcements either way, but no applications have been processed so far during this administration. I applied for a student loan discharge based on false certification due to disqualifying status (criminal record). FedLoan Servicing replied to my application requesting evidence to prove the schools were aware of my disqualifying status at the time of enrollment. The schools are refusing to provide me with any copies of my admissions applications (where I disclosed my record) or any other documentation which states they knew about my record. The Ombudsman for Dept of Ed, and Federal Student Aid Feedback Center were unable to help me with this case. The FedLoan Servicing Escalation Department was unsuccessful in getting the schools to hand over the documents also. They recommended I apply for the Borrowers Defense for Repayment since they cannot move forward with my False Certification application without physical proof that they knew about my disqualifying status. I tried finding old emails but I was unable to recover any. I began school in 2010 and finished with my masters degree in social work in 2015. I just submitted an application for the Borrowers Defense. Any ideas as to what I can do in this situation? You may get a lot of value contacting a lawyer who specializes in this. Sadly, you may need to go to court to get your records, but that could be worth it to spend a little on a lawyer if it saves you a lot on your student loans. First off, what do you owe money for? If you have Federal student loans, the school’s been paid, and you owe the government, not the school. So what’s holding up getting a copy of your transcript? Second, since you graduated, were you misled during the admissions process? Have you been able to find work? Was any fraud committed? Hi, I graduated from FMU from 2002 for medical assistant. Untill now I own $31,000 I have not paying anything since then. I always put it in forbearance, is anyone knows if I can get the loan forgiveness or the borrower Defense for Repayment discharge. Were you defrauded by your school? Another path (and one I recommend) is stop getting forbearance and get on an income-driven repayment plan. These plans also offer loan forgiveness at the end. You can’t change the past, but if you had done this in 2002, you’d potentially have forgiveness in less than 10 years. Hello, I applied for borrower defense and I would like to know how much time take to my loan be in forbearance status? Thank you. The government has basically paused all Borrower Defense To Repayment applications. We have no way of knowing when they will start processing them and issuing decisions again. I would strongly suggest getting on an income-driven repayment plan while you’re waiting. The forbearance might expire, and it’s costing you a lot in interest IF your application is denied (or only partially approved). I also applied for DTR in February, and my loans are still not in forebarance yet. Does anyone have an idea of how long it takes from the time you submit an application for your loans to be put in forebarance? Not approval, or denial, just simply forebarance. I thought as soon as the Dept of Ed receives your application, they notify the lender to stop collections. How long does that usually take? Usually you see it within the next billing cycle. Did you send your application certified mail with return receipt. Do you know when it was delivered? Since it was only February about 8 days ago, it still could be too early to expect anything. I’d like to update/Share and say that I called the Borrower Defense Hotline and was told parent plus loans are eligible. I talked to ECMC about Borrower Defense, to see if applying has any affect on the account, especially as they push me to consolidate. They said they never heard of “Borrower Defense”. I mentioned court cases regarding ECMC and people who applied for Borrower Defense, and they seemed to skip over what I was saying and push for consolation. This seemed very off-putting. Is there a reason they seemed to play dumb? After filing borrower defense, which I did a few weeks ago, I’m not sure how to proceed with ECMC. Any tips, or resources you suggest? Thank you for your reply! Your guidance is beyond appreciated! What do you mean? You need to pay your loans as normal or get on an income-driven repayment plan. It could take months (or longer) to hear any type of response. I would setup a calendar reminder to check on it every month or so. Would I qualify for the Borrower Defense to Repayment program if I have already paid off my student loans? I was scammed into attending DeVry back in 2008-2010 for a Bachelor’s Degree in HR management. I was told I could graduate in 2 years only attending part-time and I would be guaranteed job placement upon graduation, making $60,000/year. The problem is, I was never told that there is a lifetime limit on federal loans for undergraduate degrees and was too young and naive to look into DeVry’s claims. When I met this limit, I was forced to drop out of school with no degree to show for it, as I was a stay at home mom and had no money to continue pursuing my education. “Luckily”, I received an inheritance which was just enough to pay off my student loans, and just counted it as an expensive life lesson. However, when I received my FTC settlement check last year I read about the Borrower Defense to Repayment program, and realized if I could get some of that money back I could use it to go back to school. I applied even though I wasn’t sure if I qualified, just to see what they would say and haven’t heard anything; that was a year ago. Do I have a legitimate reason to hold out hope or is there nothing that can be done for me? TIA for your help! No, there is no “defense to repayment” since you’ve already repaid. I attended the Art Institute Of Phoenix in 2002 and had to drop out 2 years later because I could no longer afford it. When I started there they swore my credits could be transferred to any school, my Husband was in the Military and there was a possibility we would have to move. We moved to Oklahoma in 2005 and in 2007 I tried going back to school. All of the schools in Oklahoma with the degree program I was going for refused to accept my credits saying they only accept regional credits. I tried to see if the Art Institute of Dallas would accept my credits and let me finish online but they said they had a different degree program and I would have to start over. I called Phoenix to see if they would let me finish online and was advised they changed their program and only 22 of my over 70 credits would be accepted. I also found out that they were setting up loans without telling me. I was told I had 2 loans when they set up 8. I never saw a dime of the money they kept everything. I’ve been garnished and my taxes have been taken. Finally 5 years ago I got everything in forbearance. I found out last year about borrower defense and applied but all I hear is that the application is being reviewed. In March this year I was asked to reactivate my FSA ID so they could review the loans but nothing since. It’s now been a year and I’m in limbo. I have no way to pay off the remaining debt and I have useless college credits that no one will accept. I wish they would figure this out so I can move on with my life. Do you know how long it takes? I’ve submitted a borrowers defense of repayment back in May 2017, my loans are placed in admin forbearance at the moment. I called and they told me it’s waiting on dept of ed. I’ve went to DeVry and was told I would make a certain amount on the major I chose when I graduated but it was falsifying as well as the FTC had sent out some checks from the lawsuit. The Department of Education has been very slow to move on these applications. It’s unknown how long it will take. Seems as this process is taking forever. I filed against Devry, (btw everyone who attended should file a BD) so far its been 2 years. I recently talked to the hotline “people” (btw they know nothing about how devos is trying to change it). It all slowed down/trying to end the program bc of the new admin Trump Amin. Advise when filing out the forms on the BD, make sure you spend hours of research. FTC/Dept of ED/ NY/ ect settlments are good references. make your story on the form on how you were mislead, hammer the lies they told you esp on the false advertising. It can take 9 to 12 months on the low end. Hi there. I attended Steven Henager college online a few years ago. I graduated with $33,000 in debt only to find that none of my credits would transfer to gain a bachelor’s degree and I was not able to get a job with the degree I did hold because of accreditation issues. The degree I went for claimed it was a great stepping stone and that graduates were easily able to find jobs. I let it go for awhile and have been making my payments on time, but after looking at how the college is doing now I see they are being sued for making fradulent claims among a tirade of other things. I am currently attending a local college now but with the debt I racked up uselessly am considering putting my education on hold. Is this enough to file a borrowers defense of repayment? Maybe, it doesn’t hurt to submit your application and try. However, just because they are subject to lawsuits doesn’t mean anything. I posted back in 2017 regarding devry never telling me my loans wouldn’t cover all of the classes so I had to quit and have zero degree and zero transcripts. I’m kind of hoping I’m happy to say I logged into nelnet today and saw I’m under an admin forbearance which if I read correctly, means nelnet put the forbearance on because of my application to have my loans removed. Keep your fingers crossed. I truly hope my loans will be deleted so I can attend a real school and get away from my $10 an hour job. Where do I go to apply for borrow defense to repayment? When I checked on my taxes this year it said they were scheduled for an offset. If it is due to student loans, the last time I attended college was in 2003. All of my loans were direct loans. I never received any information on them taking my taxes this year and why after 17 years? On my credit report it said closed on the loans and I was given false information when I did attend the college. The campus is now closed so what information do I have to submit for the borrower defense repayment? I attended Everest back when it was called National Institute of Technology (2002-2003). When I went to talk to them, they said I had to apply for student aid before I could even begin the application process. I wanted to talk to my parents first but the recruiter was real pushy about getting me signed up that day. In fact, the whole process felt like a sales push. I shouldn’t have gone through with it but I did and got a Certificate of Completion that was completely useless and about $10k in debt. I was incapable of getting any job with it. The debt got passed around to different creditors until it went to FedLoan as a consolidated loan when I went back to school in 2013. I didn’t really want to get the loan in the first place but was pushed into it. I’m not sure how to get records from the school since they closed down. 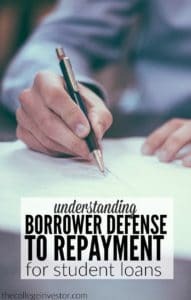 Is Borrower Defense an option for me? Is it too late? It is an option – just fill out the form. It is a long shot though. However, in the meantime while you wait for that, you still need to take action on your loans as well – get out of default and start making payments. Hi, I attended Prince Institute of Professional Studies in 2002-2005 for court reporting. I was told that court reporters were in high demand in my area and that I would make a lot of money working for a judge and all the perks that came along with it. Really used this to get people in. I was told that it would cost right around 17,000 dollars if I finished the course in 2.5 years. I was also told my classes would be accepted to any college. I was even told that if later I pursued a teaching degree, I should go for an English degree as most of my classes were English classes and it would take me far in a teaching program. I was also told they would help find me a job. When I went to learn about the school and the occupation, they never told me that I wouldn’t work for a judge that it would be contact with lawyers and I wouldn’t get paid until they got paid, that I would come out of school having to buy 10 to 20,000 dollars worth of equipment, software, and licenses, and failed to tell me that technology was slowly taking the jobs of court reporters. There was a lot more too. I graduated in their 2.5 year time frame with double the loans, learned about the extra costs afterwards, no jobs in my area and they wouldn’t help me because I didn’t attend their ceremony, and they also mailed my diploma with my name spelled incorrectly with no seals (not sure if that matters). They have since sold, and then closed. The owners during my time there have passed away. I kept little information on the school. What do you think my chances would be in receiving a discharge? Thanks for any info! As with anything here, it never hurts to apply (it will take you about an hour if you’re very thorough). At the same time, don’t hold your breath. So, also make sure you are taking the right steps on your loans if you don’t get them forgiven.